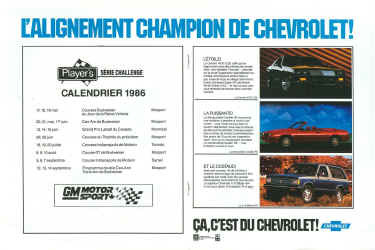 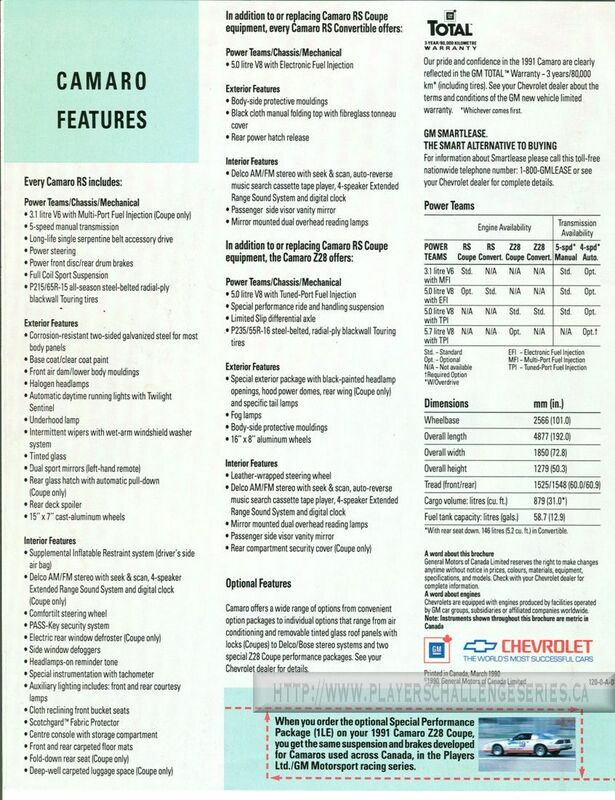 The following are advertizments featuring GM Motorsports Camaro's and Trans Ams used in the Player's Challenge Series or as it was later known, the Player's LTD./GM Motorsport series. 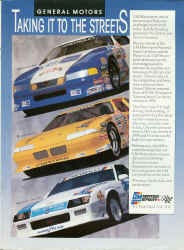 If you have any other advertizements feature Player's LTD./GM Motorsport Camaro's or Trans Ams, please contact me. 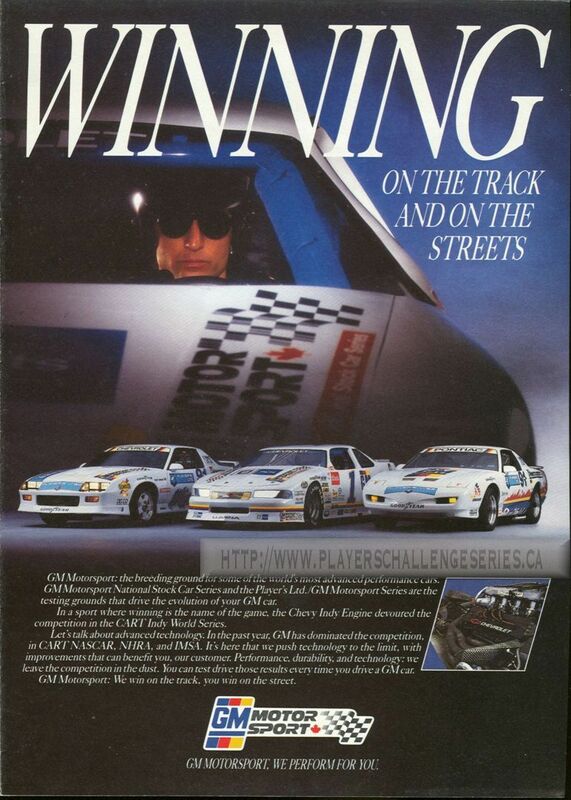 Here is an early advertizement that was published in 1986/1987 issues of "Formula 2000" Magazine. 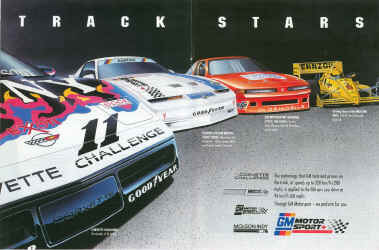 Ad featuring GM cars from 1986 Molson Indy program. 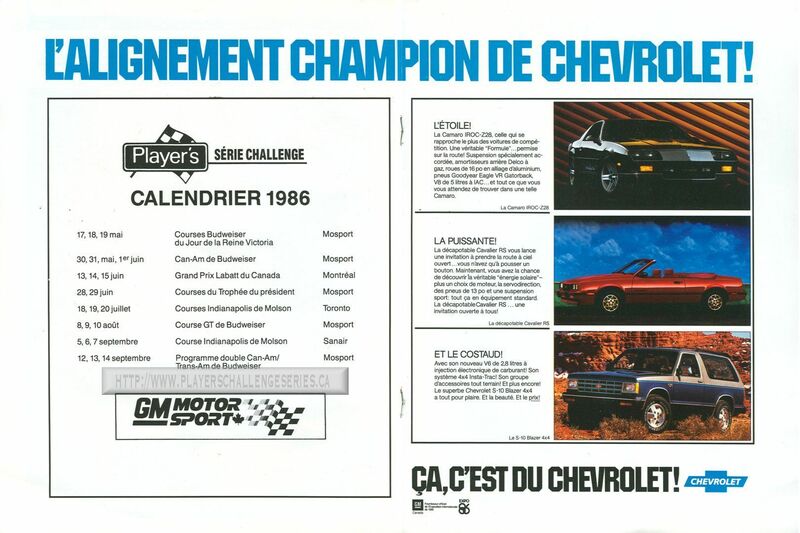 The Ad is in French. 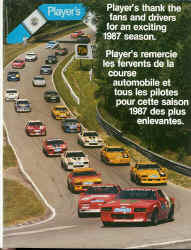 This is from the 1987 season Vol2 No4 inside cover. This is similar to GM's advertizing used in 86/87, however with the wording changed to gratitude from the usual marketing approach. 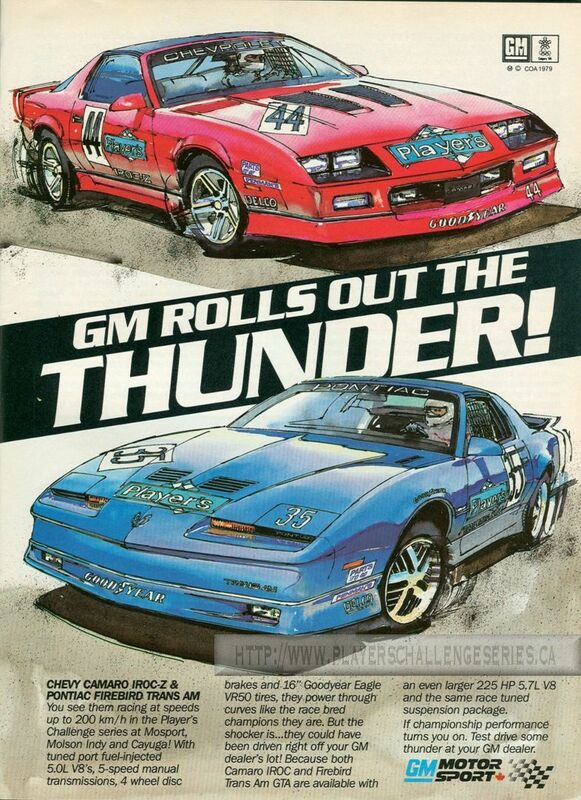 While not a GM Ad, this is a great example of the cars on the track. 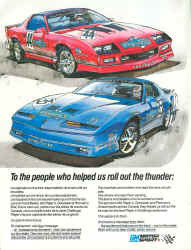 This was released in 1987 season from the inside back cover of the Vol 2, No4 issue of the series news letters. 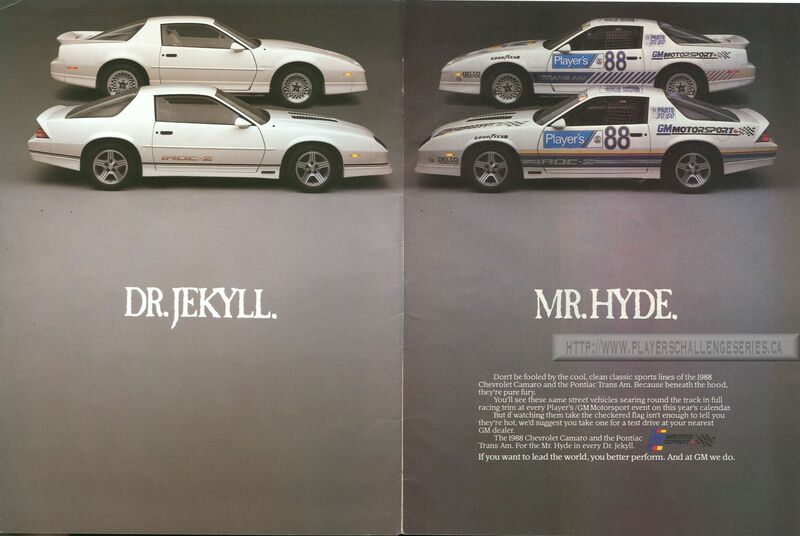 Perhaps the most famous picture from the racing series, "Dr.Jekyll Mr. Hyde". 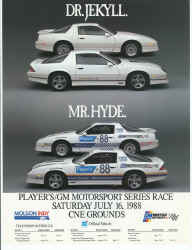 This picture was featured in many magazines, local advertizments, and was given out as both small and large posters. 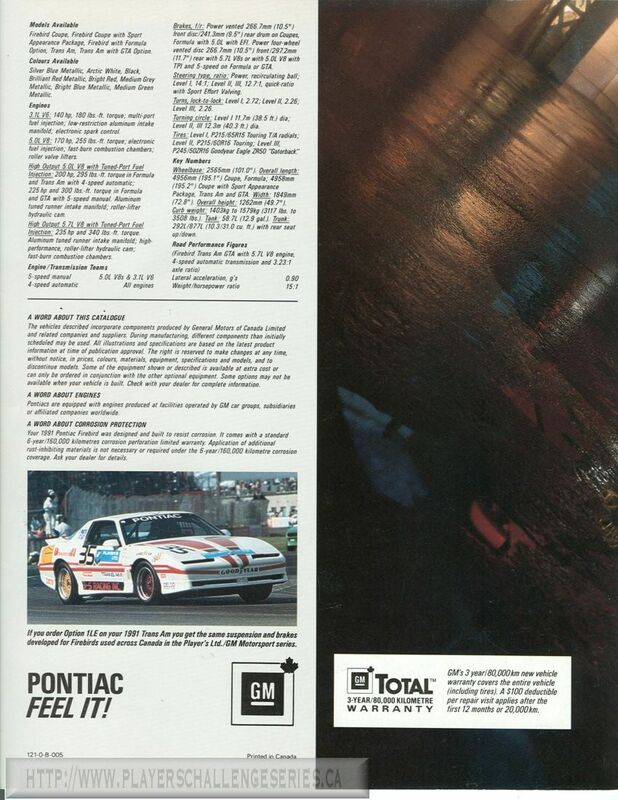 Here is the same pictures, but in a series of other layouts. 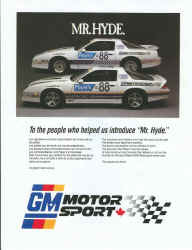 This was feature on the inside of the Championship Edition '88. 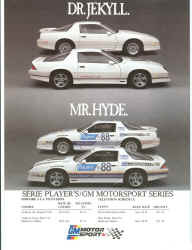 A small 8X10 handout with racing dates and locations. 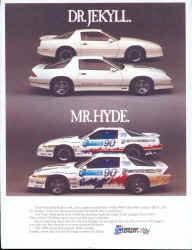 Again the Mr.Hyde was continued in 1989. This was from the inside cover of the 1989 Championship Edition. Same as as above, but in French. 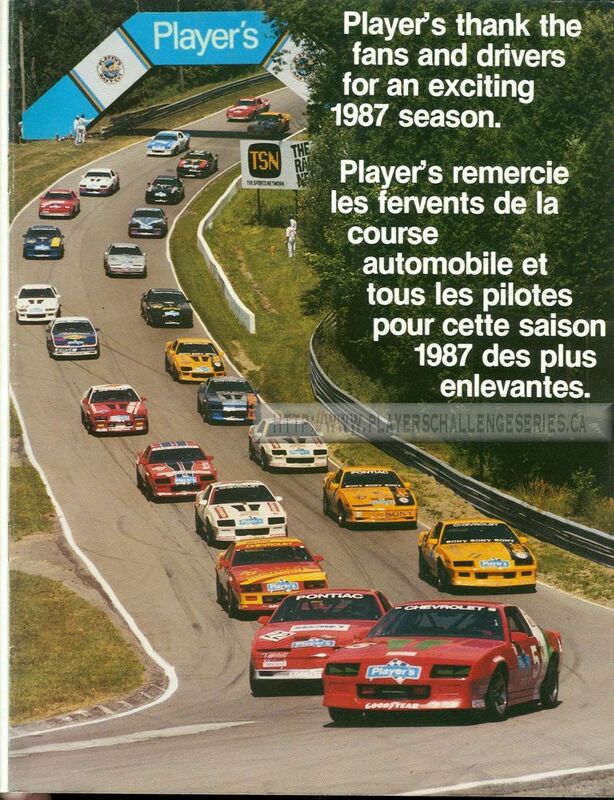 This is from the 1989 Montreal Grand Prix program. 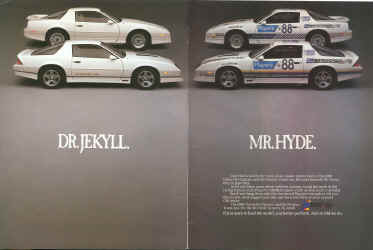 Dr. Jekyll Mr. Hyde continued in 1990 however notice the cars are the 1990 models and not the 1991 as were used in the series. 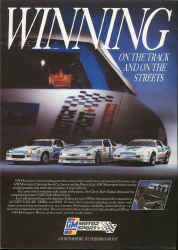 The 1990 production ended in late December 1989. 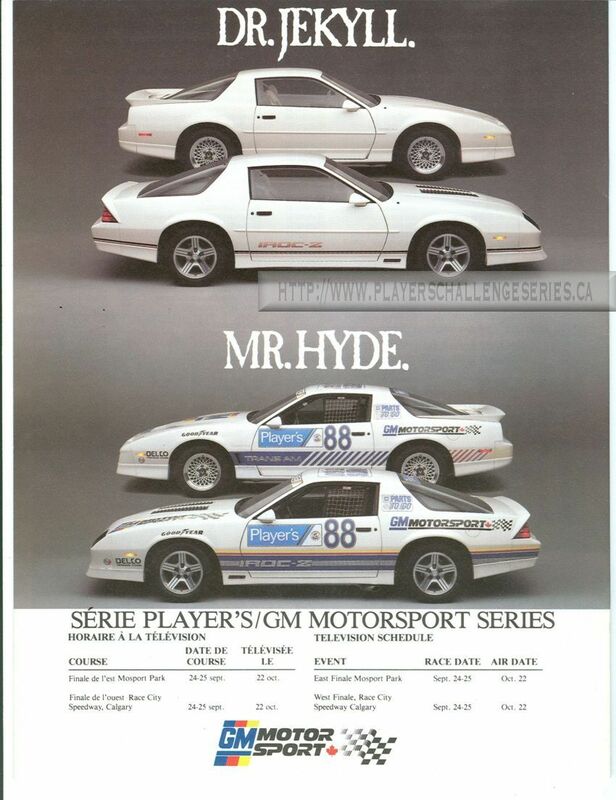 All models after that, including the 1990 series cars were actually 1991 model year cars. 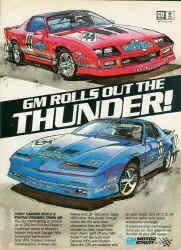 This advertizement was created in late 1989 to promote the 1990 series. 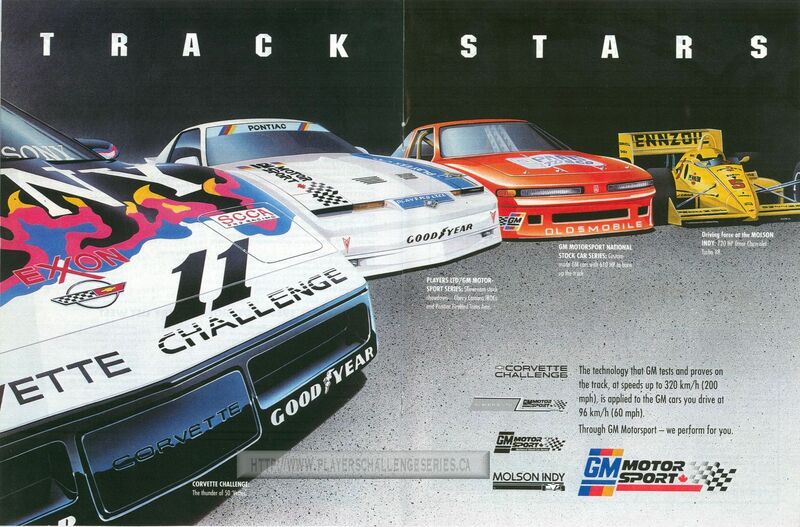 Again in 1990, GM continued with promoting all of their sponsorships in one combined Ad. 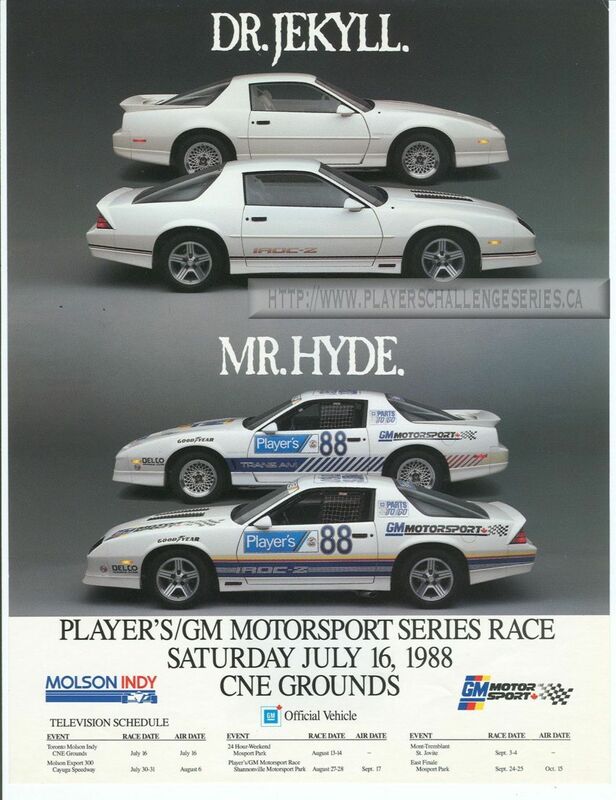 This Ad from the 1990 Molson Indy program features the correct 1991 Model year Player's cars. Another various on GM's multi car ads. 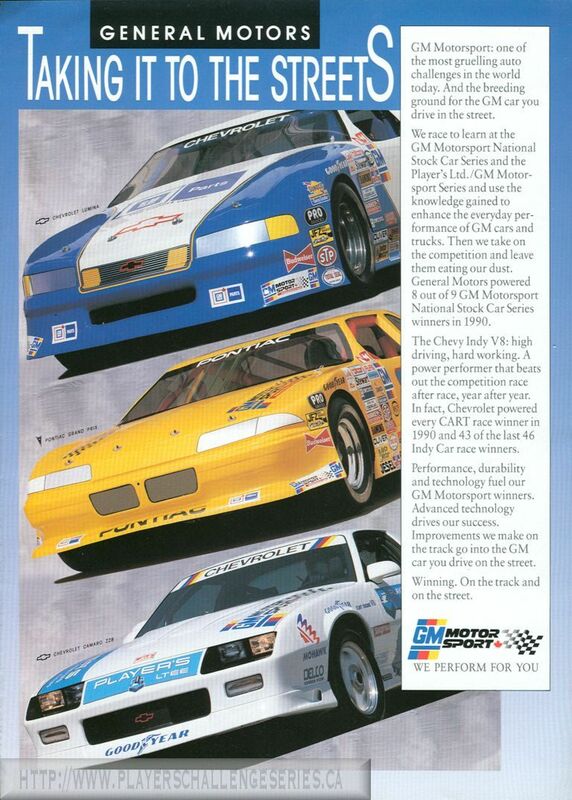 This is from 1991. 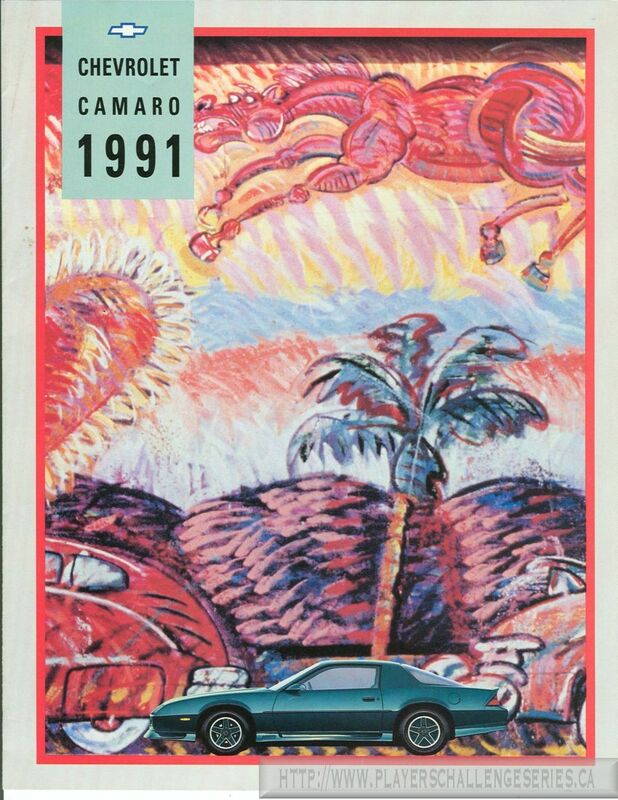 It features a 1991 Camaro with the Sunoco logo on the front fender indicating it was an Eastern car. 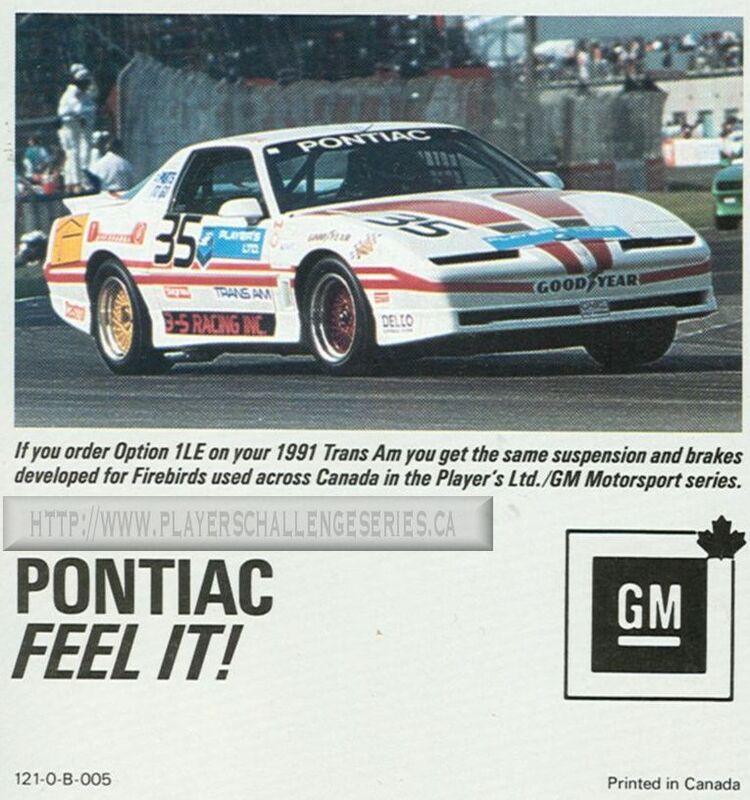 There was another car with a Mohawk logo that was campaigned out West. 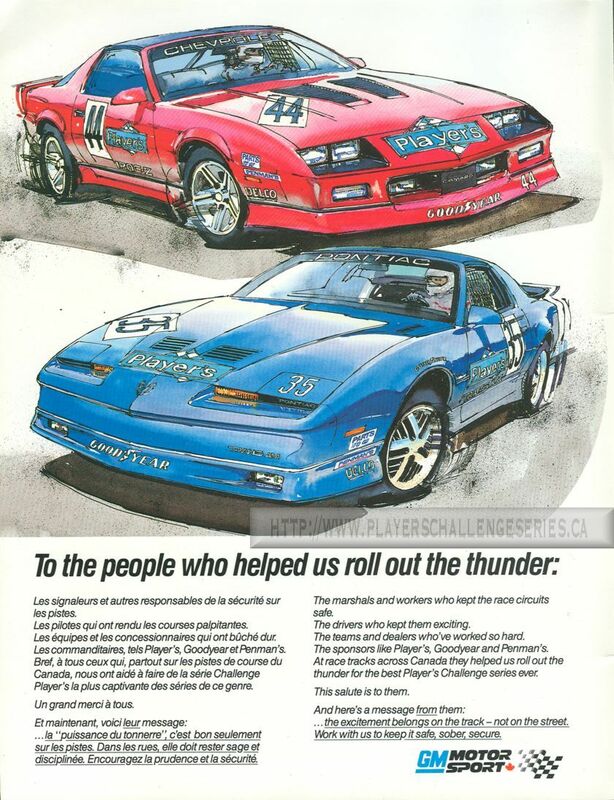 Similar ad as left, however the Camaro features a Mohawk logo on the front fender instead of Sunoco. 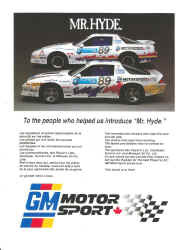 This was the difference between Eastern and Western sponsors (Sunco - East, Mohawk - West). 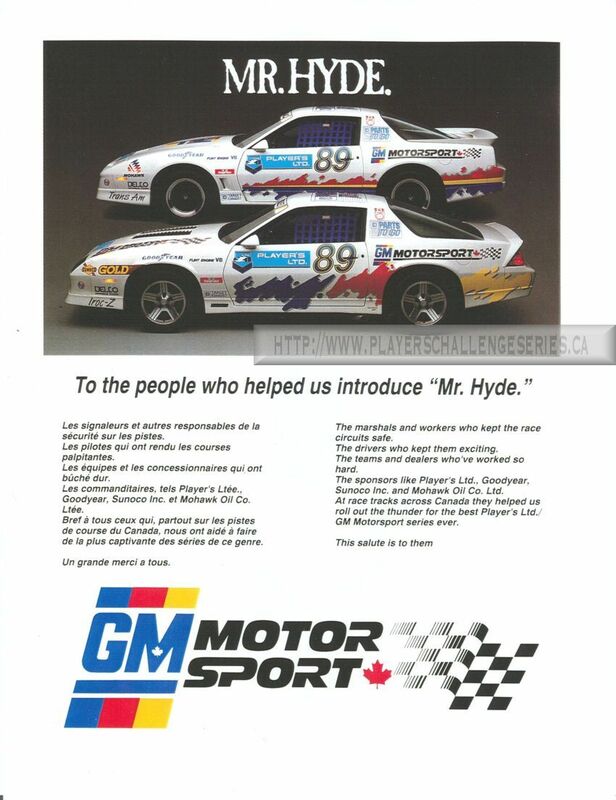 By 1992, much of the advertizing for Player's LTD./GM Motorsports had disappeared. 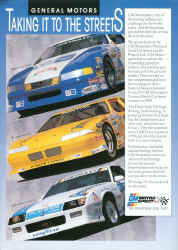 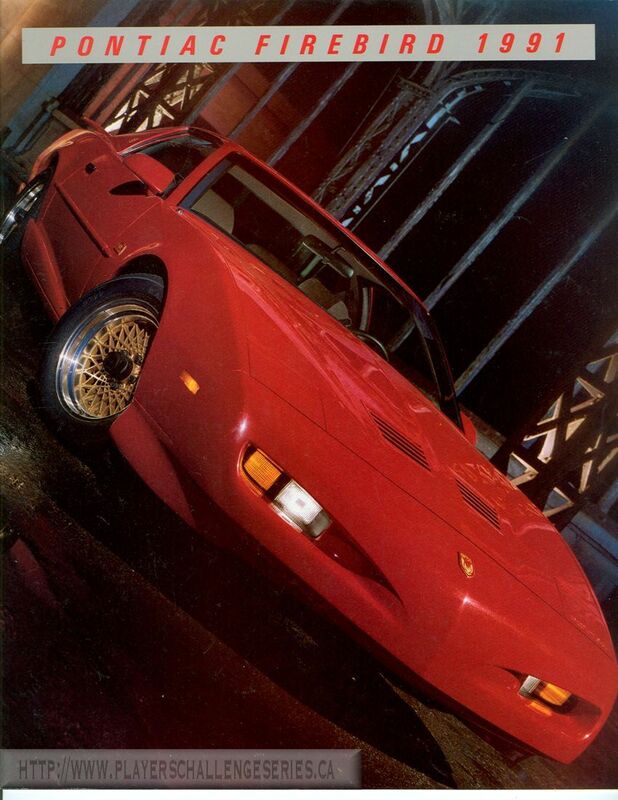 The Camaro's and Firebirds were going through a model change and by late 1992, the announcement that the series was ending had happened. 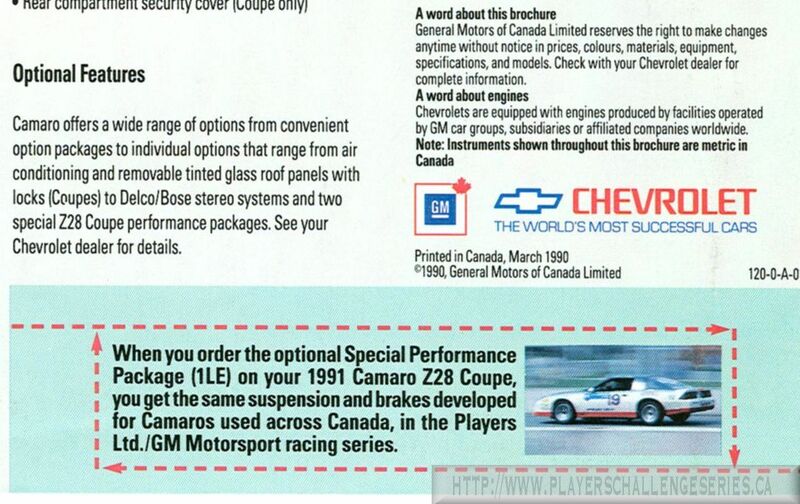 As of the time of this writing, no specific GM Motorsport Ad's have been found.